Robert Amsler, aka Doc Gage Amsler, is a former combat medic who served multiple tours in combat zones. 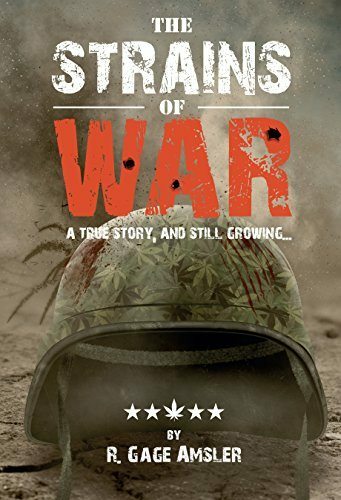 He also has a best selling book, The Strains of War, which High Times gave an excellent review. Ambler has been working to raise awareness to PTSD and cannabis therapy. During his 7 years in Afghanistan with a crew called the Dragon Slayer Task Force. Divine intervention delivered a landrace cannabis strain to him with the perfect 1:1 THC:CBD ratio that is highly effective for his condition. Ever since that snowy day at 8,000 feat in the Hindu Kush region of Afghanistan Gage has never been the same, in a good way. Cannabis has allowed Doc Gage, and many of his brothers, become grounded and in the present moment. Being in the present moment is one of the biggest reasons cannabis is so effective in treating PTSD symptoms. PTSD and the lack of treatment most veterans receive is what Doc Gage has used as his authentic motivation to help others. The seed from his cannabis find in Afghanistan someone made their way back to Michigan. This podcast is one of the most amazing ones done to date. Doc Gage is a real american hero who is fighting everyday for veterans across the country. Doc Gage understands that this plant is a medicine that was put here specifically for humans to use for their benefit. There are some jaw dropping revelations during the podcast from a former hired gun of the empire. The Marijuana Solution is proud to be able to bring this story to you. Please visit his social medial profiles below. If you have not read The Strains of War, it’s highly recommended. If you or someone you know is a veteran suffering from PTSD you owe it to yourself or loved one to purchase this book. All of the proceeds go towards helping Doc Gage’s mission of making sure no more veterans have to go without the beneficial cannabis that they deserve. Rick Naya, a true Living Legend in the Cannabis Movement Wants You to Get Involved Today. Evio Labs Co-Founder and President, Chris Martinez Sets the Bar HIGH for Third Party Cannabis Testing Labs in the U.S.